The Roman Tulis Soccer School’s Third Annual Alumni Soccer Match on Sunday, June 9th at 4:00 PM at the world-class Fortius Athlete Development Centre in Burnaby. Roman always dreamt of uniting the generations of players he nurtured over the years in celebrating the power and community of sport. For the third time this year since his passing in 2010, his dream will come true. Throughout his life, Roman was just as inspirational off the field as he was on it. He saw the community as his team, taking every chance to lend a helping hand to those around him. He recognized that we can accomplish far more together than we could ever hope to accomplish on our own, and lived this philosophy in a way that touched countless lives for the better. 2nd Annual Tulis Alumni Game A Success! The 17th of June was pegged by weather forecasters as a chance for Vancouver to showcase its infamous west coast hospitality in the form of liquid sunshine. However, Roman Sr. was clearly smiling alongside his alumni as the sunshine beat out the clouds in the first of many spectacular feats on the day. Perhaps only slightly more spectacular was the smell surrounding the training field, as instead of sweat and tears, the sweet aroma of European sausages greeted parents, players, and spectators alike as they made the time-honored trek to the Tulis facility. While Friday afternoon traffic held up the proceedings somewhat, it was clear as the Alumni warmed up that they were ready to shift to the heavy gears in memory of their beloved coach. Such was Roman’s kindness and charisma that hundreds showed up to celebrate the things that he valued most: family, charity, and – of course – soccer. With the BCCCPA on site to accept donations in support of families burdened by the stresses and financial woes of childhood cancer, games and contests for children young and old, and a fantastic evening of soccer ahead, Roman’s cleat prints were hard to miss while walking the venue. On behalf of the Tulis Family and Soccer School, we would like to invite you to join us for the Second Annual Alumni Match. It was always Roman’s dream to see his generations of players unite in celebration of the beautiful game, and although he cannot be with us in person, he will most certainly be smiling down on us for what is sure to be an afternoon of fun. 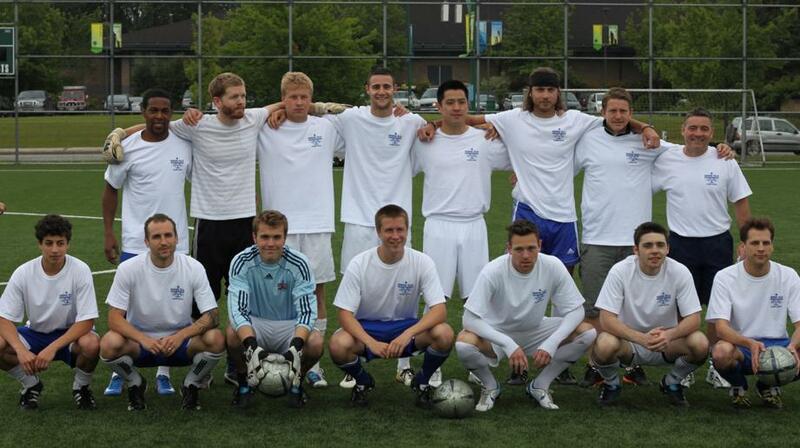 June 2010 – The first annual Roman Tulis Memorial Alumni Game could not have asked for better conditions. The sun was shining, the temperature was ideal and over 150 people where on hand to take in the game. Throughout the years, many young boys and girls have been a part of the Roman Tulis Soccer school, and on this day over 30 of them returned as adults to pay homage to a coach that touched all their lives, with more players on the sideline due to injury.